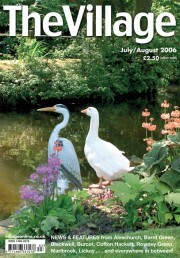 The cover of our July/August 2006 edition showed the beautiful garden at Rectory Cottage, Alvechurch – one of nine village gardens opening to the public under the National Gardens Scheme. Work was due to start on a new building to replace the existing Crown Meadow First and Alvechurch Middle schools and the village library. Construction company HBG was working with the community on projects including a “walking bus” record attempt and a cricket challenge. Meanwhile, Barnt Green’s village enhancement scheme would hopefully improve parking problems. 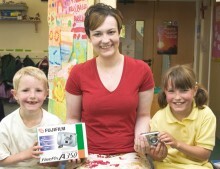 * Nicholas and Harriet Tovey, pupils at St Andrew’s First school in Barnt Green, presented teacher Louise Maund with the digital camera they won for the school in The Village Mother’s Day photo competition. 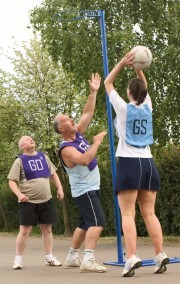 * A netball tournament at Alvechurch Middle School was one of the community events in support of village teen Andy Perrygrove, back home 18 months after suffering brain damage in a road accident. Players included Andy’s dad, Glenn, teacher Pete Rippington, and family friend Laura Elliott.